Aeroplan runs transfer bonuses a few times a year, and here is one of them. You can earn up to 30% bonus miles for transfers to Aeroplan from participating hotel partners. The bonuses are structured in tiers. Any combination of transfers from multiple partners are totalled, and you’ll get the percentage bonus depending on which tier you fall in. This is actually exactly the same as the last transfer bonus back in November 2016. This promotion is valid until April 17, and the bonus will be credited within 4-6 weeks of that date. Unfortunately, American Express and CIBC Aventura transfers do not qualify for the bonus. Starwood American Express – Earn up to 20,000 SPG Points! Starwood Business AMEX – Earn up to 20,000 SPG Points! Chase Marriott Visa – Earn up to 50,000 Marriott Points! Most hotel programs do not transfer at favourable ratios to airlines, so the only partners worth considering (in my opinion) are Starwood and Marriott. 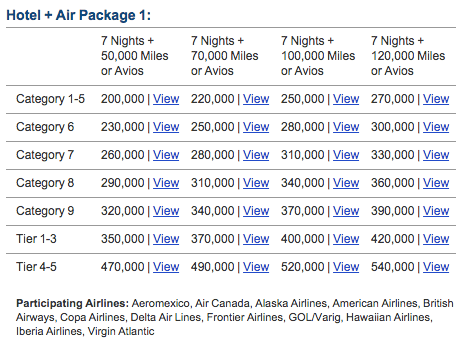 Marriott Air and Flight packages are a fantastic value if you have large amounts of points. The packages range from 200,000 up to 540,000 points. While Aeroplan isn’t the best airline program, some of their redemptions are still industry-leading in value, such as North America to Europe 1 for 110,000 miles in business class and 140,000 miles in First Class. Starwood offers a 25% bonus on transfers of 20,000 points, resulting in a 1:1.25 conversion rate. This stacks with the transfer promotion. If you wanted to hit the highest bonus amount (30%), you could transfer 160,000 Starwood Points. With their 25% 1:1.25 bonus, you’d get an additional 40,000 allowing you to hit 200,00 Aeroplan. The transfer promotion would give you an additional 30% bonus, meaning you’ll end up with a total of 260,000 miles. That’s a final transfer ratio of 1:1.625, which is an insane deal if you have plenty of SPG. 260,000 Aeroplan is enough for two roundtrip tickets in business class to Europe, making the cost for each person only 80,000 SPG. It’s also enough to get you a round-trip in First Class to Europe, a good value especially if you combine it with reduced fuel surcharges. There are amazing offers for Starwood and Marriott Credit cards, which allow you to maximize this promotion. Since Starwood and Marriott points are transferrable at a 1:3 ratio, you can combine the points you earn from both cards. The Starwood American Express and Business American Express currently has a bonus of 20,000 SPG miles apiece. If you got both and met the low spending requirements of $1000 over three months, you’d end up with 42,000 SPG miles (or 126,000 Marriott Points). Since the Chase Marriott Card comes with a 50,000 point bonus (16,666 SPG), getting all three of these cards would mean you could earn a whopping 176,000 Marriott or 58,888 Starwood points, helping you hit the next bonus tier if transferred to Aeroplan.